Amazon, Alphabet, FedEx, UPS, 7-Eleven—all are developing a system of drones to deliver packages. These drone delivery companies (referred to as “operators”) believe drone delivery can significantly reduce their shipping costs and increase the speed of their deliveries. In July 2016, 7-Eleven completed the first retail drone delivery in the United States. In December 2016, Amazon Prime Air, the Amazon drone delivery service, completed its first delivery in England. Now, Amazon is planning airborne warehouses. Federal regulations, private property rights, state property laws, and local ordinances are a few of the hurdles these operators will have to overcome before they can provide a drone delivery service. At the federal level, drone travel at high altitude is currently restricted by the Federal Aviation Administration (FAA). At the state level, travel at low altitude over private property requires agreements from a patchwork of property owners. There is a solution. Drone operators can use the low-altitude airspace above railway corridors. Operators can use railway corridors to escape federal regulation by traveling at low altitude over long stretches of private property. They gain efficiency by obtaining permission from one property owner to fly over vast amounts of private property. Railroads already have the rights to corridors in place. Furthermore, railroads have enough property that drone operators can use the railroad’s airspace for both movement and warehousing. This shipping solution is especially close to home here in Marin County where the historic Northwestern Pacific Railroad Line runs the length of Highway 101, from Larkspur to Eureka, and is shared by the Sonoma-Marin Area Rail Transit District (SMART) and the Northwestern Pacific Company (NWPCo). Changes are coming to our local railroad line, making future planning for its use even more important. In 2018, Senator Mike McGuire sponsored Senate Bill 1029, which passed, taking the first step in turning the northern stretch of the historic line into the Great Redwood Trail for hiking, biking, and riding. In addition, state and federal laws around cannabis are changing rapidly. The technology world is already heavily invested in drones for to-your-doorstep cannabis delivery (Eaze, cannabis delivery); innovators along the rail line are creating new products (Lagunitas Hi-Fi Hops, cannabis infused beverages) and doorstep delivery of local produce is popular (Farm Fresh to You, produce delivered to your doorstep.) These products are small and lightweight. Drone delivery over the railroad would give new meaning to farm-to-table. Consumers want products delivered directly and quickly. Drone operators are eager to take advantage of the savings in both cost and time. They should be just as excited to use railroad corridors to achieve their goals more efficiently, more safely, and in doing so, avoid some of the heavy regulation. Airspace can be broken into two categories: federally regulated airspace and private property. Federal regulation has traditionally focused on navigability of manned aircraft. Conceptually, the federal airspace, sometimes called the public domain, must have an upper and lower limit. Yet those limits are hard to define. The lower limit, which is important for moving goods by drone, is unclear. Aviation cases relating to private property are usually about the property owner’s desire to exclude air travel, especially at low-altitude over property, not a desire to allow it. Who has jurisdiction over low-altitude airspace is complex and unsettled. The statutes, regulations, and court decisions have historically focused on manned aircraft and come from a time when drones did not exist. Recreational drone use fits within the FAA’s Special Rule for Model Aircraft. Commercial drone use does not fit that rule and the FAA is developing new ones. The United States Government has exclusive sovereignty of airspace of the United States and a citizen of the United States has a public right of transit through the navigable airspace. (49 U.S.C. § 40103.) Congress has delegated the administration and regulation of “navigable airspace” to the FAA, part of the Department of Transportation. (49 U.S.C. § 40103(b).) The regulations address efficient use of the airspace and protecting people and property on the ground. This leaves open the question: What is airspace and is it the same as navigable airspace? In summary, the situation is complex because the limit for navigable airspace varies depending on the situation. Currently, the FAA regulations begin at 500 feet and move upward. But 500 feet is not a jurisdictional limit. The FAA simply has not exercised its jurisdiction below that level, except to tell drones and model aircraft to stay below the minimum safe altitude of navigable airspace, specifically to stay below 400 feet. The grey area is somewhere between the property rights of those on the ground and the minimum safe altitude. There are also exceptions to the lower limit of navigable airspace, such as the airspace needed for takeoff and landing, and airspace used for emergencies. Both are considered part of the federal airspace, but elude exact definition. Somewhere near the ground seems to fall within state jurisdiction. (Though not precisely defined, “navigable airspace” has until recently been thought of as generally describing airspace beginning at a point higher than 400 feet above ground level, as demonstrated in part by a 1981 FAA Advisory (AC 91-57). Senate Judiciary Committee Summary of SB142, 4/6/15. While the FAA does not set 500 feet as a limit to their jurisdiction, in the Small Unmanned Aircraft Systems (UAS) Notice of Proposed Rulemaking Summary, the FAA proposes to restrict Small UAS to a maximum of 500 feet.) And there may be a space in the middle that could be regulated by both the state and federal government, either, or neither. Because of the federal jurisdiction over air travel, the states’ roles have been limited to either not regulating at all or preventing drone use in public spaces and over private property when they are unwanted. Logically, this leaves drones traveling at low altitudes in private airspace, with the property owner’s permission. Companies like Amazon and 7-Eleven are testing their service in locations where they have permission to fly. But they seem unable to expand beyond a few neighboring properties. With the regulations in place, they can’t make a longer distance delivery. But unlike the federal law, the state law definition of “aircraft” includes only manned vehicles. (Pub. Util. Code § 21012.) California law does not address flight of unmanned aircraft, a large hole in the regulatory scheme. Arguably, if a drone is in California airspace, it is unrestricted. States have jurisdiction over property and some portion of the airspace above it. Relevant property law includes the right to possess, the right to exclude, and the right to transfer. Property comes in all shapes and sizes, each with many types of owners, including individuals, companies, and the government. There are small plots of residential and commercial land in cities. There are city parks. And there are state and federal forests and wilderness preserves. There are local roads, state roads, and interstate highways. And there are railroads. Drone delivery, especially over a railway corridor used for moving freight, should be enough to meet the Causby criteria of being a use “in connection with the land,” since both the drone and the railroad operate to deliver freight. In the case of a railway corridor, what might otherwise be non-navigable may be navigable for a limited use, such as unmanned drones, also delivering freight, over predictably-sized rail cars. When a drone flies at an altitude below 400 or 500 feet, it encounters private property. Flying over a series of residential parcels can lead to noise complaints and more catastrophic crashes. Flying over parks causes similar problems. Flying over a highway can lead to interference with cars and traffic, both as a distraction to drivers and catastrophic crashes. But flying over large trains, which move predictably along major corridors of private property, has few of these problems. There is little problem with distraction, few pedestrians, and nearly no noise problem. As with the large drone test sites, like the rural farms and airports that Amazon is using, railroads have one landowner for a major stretch of land, making a single agreement enough to cover many miles of travel. Can the Airspace Right Be Transferred? The state private property right to exclude others from one’s property is well settled, but the ownership and transferability of airspace over private property is less clear. Can airspace above property be owned and conveyed? Ownership of airspace can be separated from the ownership of the land. (Miller and Starr, § 9:33.) It is possible to subdivide land vertically and transfer airspace with no interest in underlying land, although the airspace may need easements for support. (Civ. Code §§ 4125(b) and 6542(b).) For example, the California Department of Transportation can lease airspace above highways and a property owner may grant open-space easements over private land for preservation. (Miller and Starr, § 9:33; Sts. & Hy. Code § 104.12; Gov. Code §§ 51050 to 5165.) The creation of high-rise condominiums is another example of this phenomenon. The concept of transferring airspace in the form of an easement, lease, or license is a logical one. These forms of property ownership exist for other purposes. Nothing in California law prohibits such a transfer, yet a search of statutes, cases, and secondary sources suggests no one has tried it yet. Railroads and drone operators should develop a freight easement for airspace above the height needed for trains and below the federal navigable airspace. Railroads, long contiguous corridors of private property, are the ideal solution for drone corridors. The rail network connects most major cities, both to each other, and to ports throughout the United States. The two major railroads that operate in California, the Burlington Northern Santa Fe and the Union Pacific, alone cover 5,412 miles within the state. The short-line railroads, small railroads that connect to the major lines, add additional mileage. The following image shows the rail network within California. 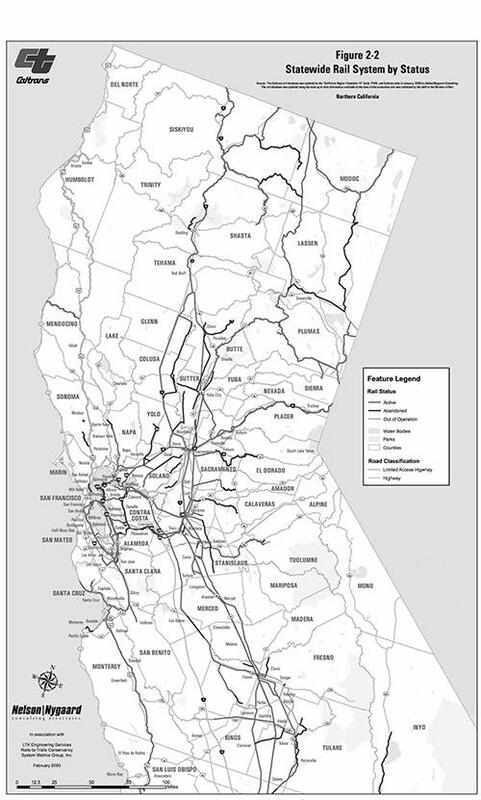 Image: California Statewide Rail System map. The California State Rail Plan states that California is a key link in the national freight rail system. The State Plan considers active, inactive, and abandoned railroads as a major route of travel, not only for freight trains but also for passengers, trains, bicycles and pedestrians. The State Plan, though, does not mention drones as a user for the rail network. An opportunity exists, here in Marin County, to develop a property right in the low-lying airspace above surface property, and transfer that right in the form of an affirmative easement for use. The right would relate back to the surface owner’s use of the property, and be within the bounds of being in relation to the surface owner’s existing and present beneficial and convenient enjoyment and also be below the minimum safe altitude of navigable airspace that is regulated by the federal government. The logical link between freight trains and drones is that they both transport freight, and it is the existing freight transportation that relates back to the surface land. This concept has not been tested. Using a railroad as a drone corridor has major business benefits: increased efficiency and increased safety. It also has major legal benefits: it based on the railroad’s private property rights. Finally, it has public benefits: it can increase the economic viability of a public resource, the railroad, providing another valuable use for this property. Anyone who wonders what value an airborne drone-operated freight service could have to a rural area like the north coast need only look as far as the wine industry or budding cannabis industry. There is certainly agriculture along the historic Northwestern Pacific Railroad Line. If those producers used the railroad, they would have a direct path to doorstep deliveries in the Bay Area in no time. Jonathan Kathrein is an attorney at Ragghianti Freitas LLP in San Rafael. Growing up in Marin County in the 80s and 90s, he noticed the historic Northwestern Pacific Railroad Line and wondered why it was not used. Now, his legal practice focuses on land use and real estate transactions, with a specialty in railroad issues. A version of this article, The Future of Drones is the Railroad, was published in the University of San Francisco Intellectual Property and Technology Law Journal (2017) and in the California Real Property Journal (Volume 36, Number 2, 2018). Since the author first wrote about this concept, the legal landscape has evolved. FAA rulemaking has progressed and laws around cannabis have changed dramatically; both continue to change. The author does not advocate the use of alcohol or cannabis but only mentions it as an example of product that originates in the north coast and could be shipped by drones over the railroad.